Steak Saws « Gluttoner: You gonna eat that? Steak too tough? Is your knife just not enough to cut it? 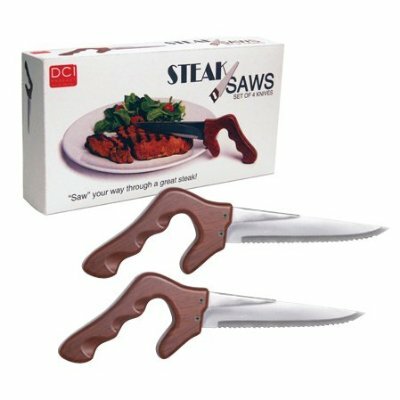 It’s time to break out the big guns- the Steak Saws are real stainless steel steak knives with plastic saw handles. Actually as humorous as this product is, the vertical handle could really be useful for people with arthritis or who have difficulty grasping onto a normal steak knife.